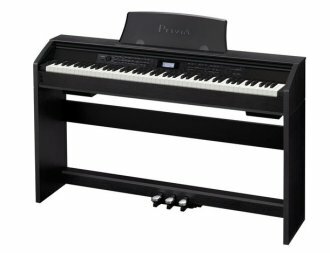 The Casio PX-780 represents a significant step in the continuing evolution of the Privia digital piano line. 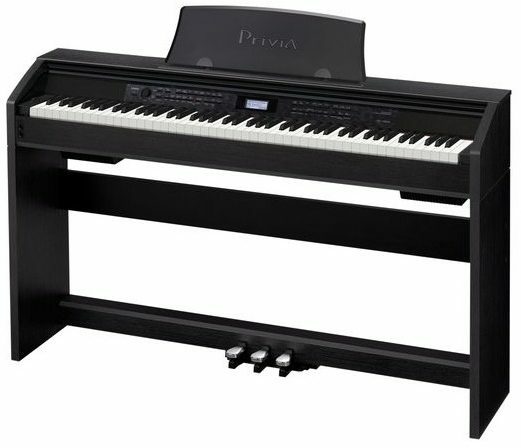 A combination of low keyboard action and a powerful sound engine provide a great level of detail, nuance and expression for a superior grand piano experience in the lightweight and stylish design that Privia is known for. The award winning grand piano sound in Privia has been dramatically improved. The PX-780 utilizes more than three times the memory of the previous generation for a more natural piano tone. In addition, Casio's proprietary sound source "AiR" (Acoustic and intelligent Resonator) provides unmatched realism and detail. This engine provides seamless dynamics for a remarkably expressive and powerful performance. For further realism a Damper Resonance simulator provides the rich sound of the strings when the sustain pedal is used. The PX-780 also features redesigned 88 note Tri-sensor scaled hammer action keyboard. This action features simulated Ebony and Ivory textured keys for a incredible feel and it's three sensors capture the dynamics of a performance with unparalleled speed and accuracy. To further enhance the experience, the action and the sound engine take into consideration the speed at which different sized hammers move inside acoustic grand relative to velocity the keys are pressed, this timing nuance provides the ultimate key to sound experience. The PX-780 has a total of 250 instrument tones built-in. Strings, organs, electric pianos, brass, drums, bass and more and with the PX-780's registration capability you can store your favorite splits and layers for live performance use. The PX-780 also has 180 drum patterns with full auto accompaniment and a 17 track recorder for composing your own songs. Ready for the stage or studio, the PX-780 has easily accessible audio outputs so you can easily connect the PX-780 to recording and sound reinforcement equipment. To reproduce the sound of the finest acoustic grand pianos, the Privia series features Casio's proprietary AiR (Acoustic and intelligent Resonator) processor. Accessing more than three times the memory of the previous generation, the AiR processor utilizes grand piano samples recorded at four dynamics sampling to deliver grand piano sounds with long natural decays and remarkable expression. To further the grand piano experience, AiR adds realism by simulating the sound of the open strings when the dampers are raised by the pedal. - "Multi-dimensional Morphing AiR Sound Source"
Available until 11 PM (EST) today. Mention special code 1ZZ-JW1P when you call.